Meet with clients who desire an order of protection from domestic violence. Prepare, review, and file pertinent legal documents, including gathering admissible evidence such as medical and ER records, photographs, and police reports to support a request for a protective order on behalf of domestic violence clients. Issue subpoenas to obtain the appearance of important witnesses at court hearings, such as ER and treating doctors and nurses, police officers and neighbors who witnessed the abuse in order to support the testimony of the clients. Protect clients from harassment and badgering in court. Represent clients in Caddo District Court and Caddo Juvenile Court to obtain protective orders and necessary ancillary orders such as child custody, and support. Coordinate efforts with Caddo and Bossier Parish law enforcement agencies including Project Celebration, Legal Aid of North Louisiana, Family Justice Center, District Attorney’s Office, Mayor’s Office and Clerk of Court. Attend events to give presentations about the program to the local community. Attend Training Seminar on Protective Orders. Licensed to practice law in Louisiana and in good standing. Submit and answer discovery requests. Proficient in using Microsoft Word, Excel and case management software. 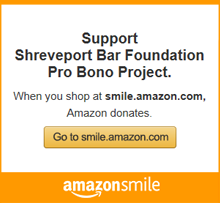 The attorney will work under the direction of the Shreveport Bar Foundation Board of Directors and Executive Director and is responsible for using best practices within the adopted budget, guidelines and policies of the SBF. This position is funded by an 18 month grant from the Community Foundation. Submission deadline is Monday, February 11, 2019.